Good snowy day bloggers! For the first time this winter for us, we had a wonderful day of nothing but snow yesterday! The kids were soooo excited, they played pretty much all day in it! We then enjoyed some hot cocoa and homemade veggie soup for dinner. I hid in my warm craft room!! If you guys remember, last year I made for http://www.thepaperplayers.blogspot.com/ an apple easel sticky note pad holder (I won too for it!!) Anyway, I had someone ask me for the directions on how I made it. (if you would like it, I can email it to ya, just let me know) I decided to make a new version for my next stamp club. Remember, I made two projects to give away. The projects are the opposit of what we are making. 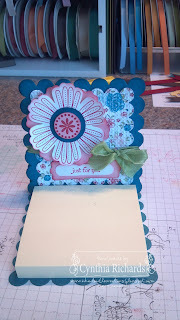 This month it is a card, so the projects to give away is a scrapbook page and a 3-d project, which is this. These items go to the hostess for that month! They really enjoy the extra surprise items to take home. I love your note holder, but don't understand how the back stands up. I have made note holders in the past but have never had the back to stand up. This would be great to have on your desk showing off the lovely flowers. Wow....what a hive of inspiration....I have just discovered your blog thru an old post of Kim Score's!!! I love your projects. I wld love to take you up on your offer of e mail instructions for this wee project. I saw the "apple one" and BINGO.....teacher's chrissy gifts!!! Thanks so much for providing so much inspiration.